Published: Jan. 6, 2019 at 11:12 p.m. The 2018 Wild Card Weekend was filled with feature matchups with three out of four games ending with less than a one-score differential. Take a look at some of the best photos from Wild Card Weekend. 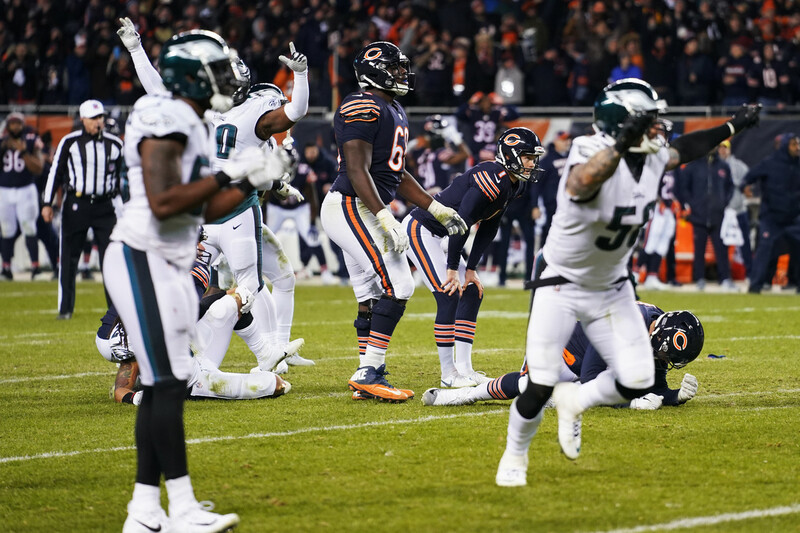 Chicago Bears kicker Cody Parkey (1) looks on as his field goal attempt hits the left post, the crossbar, and bounces short of the field goal post to end an NFL football NFC Wild Card playoff game against the Philadelphia Eagles. The Bears lost to the Eagles 16-15. Dallas Cowboys quarterback Dak Prescott (4) flies for the goal line and makes a first down against Seattle Seahawks defensive end Frank Clark (55) during the second half of the NFC wild-card NFL football game in Arlington, Texas, Saturday, Jan. 5, 2019. Los Angeles Chargers wide receiver Keenan Allen (13) leaps up to catch a pass over Baltimore Ravens cornerback Jimmy Smith (22) during an NFL wild card football game on Jan. 06, 2019 in Baltimore, Maryland. Houston Texans free safety Tyrann Mathieu (32) rallies his teammates before an NFL wild card playoff football game against the Indianapolis Colts, Saturday, Jan. 5, 2019, in Houston. Philadelphia Eagles cornerback Cre'von LeBlanc (34) knocks the ball loose from the hands of Chicago Bears wide receiver Anthony Miller (17). The resulting fumbled ball was not recovered by either team before the whistle was blown, resulting in an incomplete pass. Dallas Cowboys quarterback Dak Prescott (4) celebrates on the field with center Joe Looney (73) after a touchdown try against the Seattle Seahawks. Prescott led the Cowboys to a 24-22 win against the Seahawks with an 11-yard passing touchdown to rookie Cowboys wide receiver Michael Gallup and a game-winning touchdown run with less than three minutes remaining in the game. Los Angeles Chargers running back Melvin Gordon (28) hurdles over Baltimore Ravens cornerback Jimmy Smith (22) on 6-yard pickup a during a NFL wild card football game, Sunday, Jan. 6, 2019, in Baltimore. Baltimore Ravens quarterback Lamar Jackson (8) looks on from the sidelines during an AFC Wild Card NFL football game against the Los Angeles Chargers. After completing just 2 of 8 passes with an interception for a 0.0 quarterback rating in the first half, Jackson led the Ravens on a 14-point fourth quarter rally putting his team within six points of the Chargers. The Ravens, however, still came up short, losing to the Chargers 23-17. Sunlight shines through the windows of NRG Stadium as Indianapolis Colts quarterback Andrew Luck (12) looks to pass during an NFL wild card football game against the Houston Texans Jan. 05, 2019 in Houston. Indianapolis Colts wide receiver T.Y. Hilton (13) looks in a pass as Houston Texans inside linebacker Benardrick McKinney (55) attempts to cover. Hilton caught five passes from quarterback Andrew Luck (not pictured) leading his team with a 17.0 yard per catch average as the Colts defeated the Texans 21-7.